Hitting the Num Lock, Caps Lock, or Scroll Lock keys on the computer keyboard by accident can lead to undesirable consequences. You may wonder why you cannot type numbers in the Calculator when using the number pad on the keyboard after hitting Num Lock, or why your password is not accepted after activating Caps Lock by accident. While you can add programs like NumCapsScroll Indicator that highlight which of the special key is activated on the device, you may also configure Windows 10 to play a sound whenever one of the keys is pressed on the keyboard. Note: it is possible to disable the Caps Lock key and other special keys permanently. If you never use it, you may want to consider doing so or remapping the key. Windows 10 comes with a new, somewhat hidden, option to enable a feature that Microsoft calls Toggle Keys. It is disabled by default and needs to be turned on using the Settings application. Most Windows 10 users don't know about the function probably because it is located in a place in the Settings application that most users probably don't check out. Note: The Windows 10 version the guide was written for is version 1803. I don't know if the feature was available in previous versions of Windows 10 as well (let me know if you know). Open the Settings application with the keyboard shortcut Windows-I. Go to Ease of Access > Keyboard. Find the "Use Toggle Keys" preference and switch it to on. When you enable Toggle Keys, Windows will play a sound whenever you activate the Caps Lock, Num Lock or Scroll Lock key on the keyboard. Windows 10 plays two different sounds depending on the state the key enters. The on-sound has a higher pitch, the off-sound a lower one so that you can determine the state of the key from the sound alone. While you can enable the Toggle Keys option using the Settings application, you may also enable it by holding down the Num Lock key for five seconds straight. Doing so displays the following prompt to enable Toggle Keys if the feature is not enabled already. You can disable the Num Lock long-press hotkey in the Settings by removing the checkmark from "allow the shortcut key to start Toggle Keys. Now You: Do you use Caps Lock, Num Lock, or Scroll Lock? 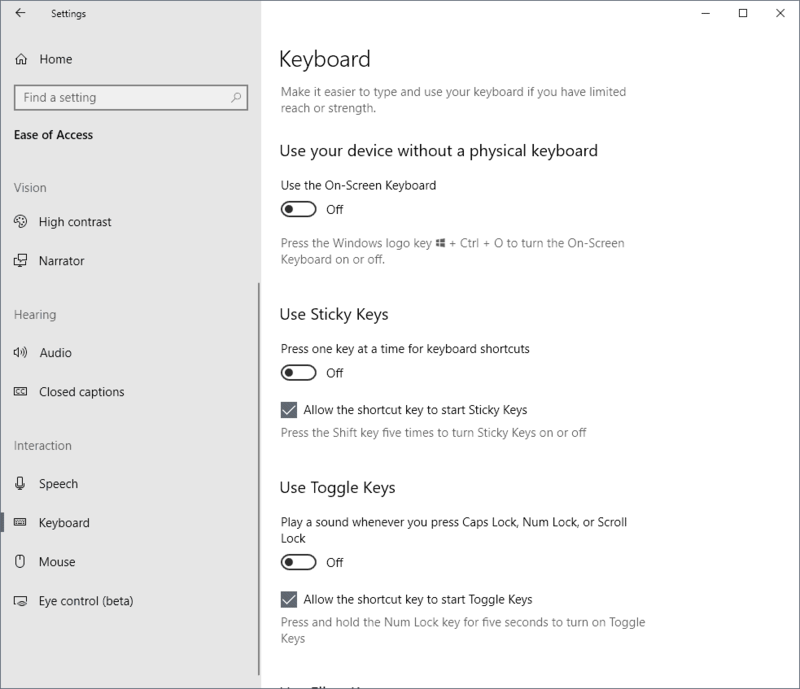 Find out how to configure PCs with Windows 10 to play a sound whenever you toggle the Caps Lock, Num Lock, or Scroll Lock keys on the keyboard. but i use numlocker to keep my numlock on at all times. I can’t figure out why americans don’t want to use the numpad section as numeric. probably same reason why they use day and month in an absurd order. but I even more hate it when they decide they i Also don’t need the numeric section. But it’s there and called numpad for a reason !!! As others have commented, this feature is not new. I’ve been using it since XP Pro. I would be lost without it. (However, I would far prefer a popup on my screen as I hate having to keep my speakers turned on all the time). I am currently using it on a Windows 8.0 Pro machine and Windows 10 Pro 1709 machine. I didn’t really need it on 98SE or even XP as the keyboards were decent then and you could easily see in a fast glance if one of the locks was on accidentally. However, keyboards have gotten worse and worse the past ten years and I am disgusted with them currently for this and other reasons. (I am referring to DESKTOP keyboards as my machines are all desktops and always have been). I have a new Dell XPS 8930 machine that came with a pitiful excuse for a multimedia keyboard. I had to dig out an old keyboard but even it does not properly display the lights for those three toggle keys.